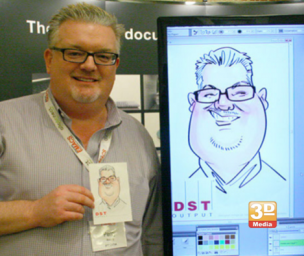 Bring your brand to life with e caricature artists! In just moments, our artists will sketch cartoon pictures of you and your guests. Guests are entertained and everyone leaves with a caricature as a party favor. E Caricature artists are caricatures that are drawn & colored digitally live at events, trade shows and parties. Our artists use a digital drawing tablet to work their magic in minutes. Guests enjoy watching each e caricature artists take shape on a nearby large display. Once your e picture is finished, the artist prints out your very own color copy to take away with you. In addition, we provide all our clients with a link to the digital picture drawn during their event. Social Engagement Guests can share their digital picture with friends, colleagues by posting them to their social media accounts like Instagram and Twitter!